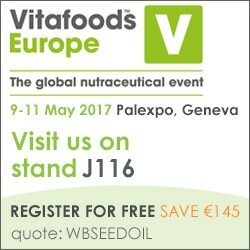 To register for your entry into Vitafoods Europe 2017 use the link on the banner. Read more about the Vitafoods exhibition below, courtesy of Vitafoods. With an increasing demand for innovative all-natural and non-modified products which are easily available and specifically tailored to meet the unique physical and cultural needs of each consumer, the pressure on the global nutraceutical industry has never been greater. To meet the consumer demand for preventative personalised health solutions, the industry needs to identify both new ingredients that are safe, reliable and accessible as well as offering innovative delivery forms and opportunities for geographical and cultural customisation. Excellence in research and substantiated science provides the foundation for innovative, safe and compliant product development. Business success, regulatory compliance and the maintenance of competitive advantage will only be achieved through close collaboration between the scientific community, government and industry. Bringing together some of the leading names within both academia and industry, the Vitafoods Europe Conference 2016 provides a platform to bridge the gap between science and industry, enabling the sharing of critical knowledge and the facilitation of new partnerships.